During the bitter cold winter months, pet owners have to be extra cautious when it comes to their furry friends. The truth is, it gets downright cold outside, and that is why most people bring their pets in at night during the winter months. While most people are familiar with properly caring for their pets during the cold weather, they may not know everything. Ice melt is a familiar product used in the colder regions to help melt the snow and ice on the roads. Typically, it is a salt mixture that contains either calcium chloride or sodium chloride. These are both chemicals that can be harmful to your pet. First and foremost, we need to take a look at the risks that are associated with ingesting ice melt. This is important, because even if you don’t see ice melt on the road, there may be residual amounts left behind. This can still be harmful to your pet. For instance, if your dog walks around and gets even a small amount on their paws and licks it off, it can cause them to vomit or have diarrhea. In larger quantities, it can actually be more harmful, or even fatal. In fact, dogs that ingest 4 grams of sodium chloride or calcium chloride per 2.3 pounds of body weight could be at risk for death. That means that a dog that weighs around 4 pounds would only need to consume 2 ounces of ice melt and they could die from it. If your dog has been exposed to ice melt, you will probably need to be aware of the symptoms. Here are a few things that you should look for. If you begin to notice any of these symptoms, talk to your veterinarian right away. Typically, the symptoms will get progressively worse and you will want to get prompt medical attention. So you know that you must keep your dog from ingesting the ice melt, but what happens if they walk on it or sit down on it? One question that is often asked is whether or not just coming into contact with the chemicals used in ice melting products is dangerous for dogs, and the answer is yes. These chemicals can actually cause pretty serious skin irritations at a minimum. It can lead to itchiness, redness, tenderness and rash. Not only could they lick it off of themselves and indirectly ingest it, but they could also have some pretty uncomfortable skin irritations. It is best to just keep your pet away from the ice melt, or at a minimum make sure that you protect them with protective wear when you take them outside. Take a look at the various different ways that you can protect your pet. Here are a few tips that will prove to keep your pet out of harm’s way when it comes to using ice melt to melt away the snow and ice from your driveways and walkways. Look for non-toxic ice melting products that will be safe for your pet. There are several different products that you can choose from. By choosing a product that is non-toxic and safe for pets, you can rest assured that your dog will be safe. Morton Safe-T-Pet and Safe Paws are among the most popular brands of non-toxic ice melt on the market. When you go outside, always keep your dog on a leash. While you may be able to use certain non-toxic ice melting products to keep your pet safe, it doesn’t mean that your neighbors will do the same. Most people that don’t have pets won’t think about the products that they use to melt the ice. By keeping your dog on a leash, you can keep them out of areas that you may be unsure of. Choose a quality pair of snow boots for your dog to wear during the winter months. The boots will not only protect their delicate paws from the ice melt, but it will also keep their paws dry and warm. 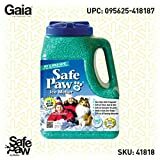 When the weather is cold, you don’t want to run the risk of your dog getting any snow or ice clumped in their paw pads, and this is a great way to protect them all the way around. Avoid allowing your dog to drink the puddles that are left behind when the snow melts. You never know if the snow has just melted on its own, or if there was a chemical used to melt it. This is especially true if your city sweeps the street with ice melt to make the roads safe for drivers. The best way to ensure that your dog has safe drinking water is to take a portable dog water bowl with you when you are out and about. This will prove handy through the summer months as well, and is a great investment. As you can see, keeping your dog safe from the ice melters used during the winter months is not really that difficult. The main concern is that we need to raise awareness because unfortunately many pet owners are not aware of the fact that it is toxic for pets. Don’t put your pet in harm’s way. Let your friends and family know the risks involved so that they can keep their pets safe too!